With a McDonald’s, Chick-fil-a or Taco Bell seemingly on every corner, finding vegan or vegetarian options appear to be few and far between. However, what if you had the ability to see all of the healthy food options in your area just as easily as you can see the Golden Arches? Well the “Healthy Dining” app is a mobile application, available for both android and iPhone, designed to help vegans, vegetarians and those who are interested in healthier eating discover options in their area. Using your phone’s GPS the Healthy Dining App is able to see your location and show you all of the healthy food options in the area, no matter where you are in the world! Whether you are starting to work out or changing your diet, making lifestyle changes are tough especially if you don’t have the support of those around you. One of my favorite features about the Healthy Dining App is the community it creates amongst users. Using a swipe feature users can connect with other healthy eaters in their area to share recipes, hidden food gems and even meet in person to share a meal. So even if you are the only one in your family or friends circle on the vegan, vegetarian or healthy eating journey, you can always find a match and companion for a great meal. 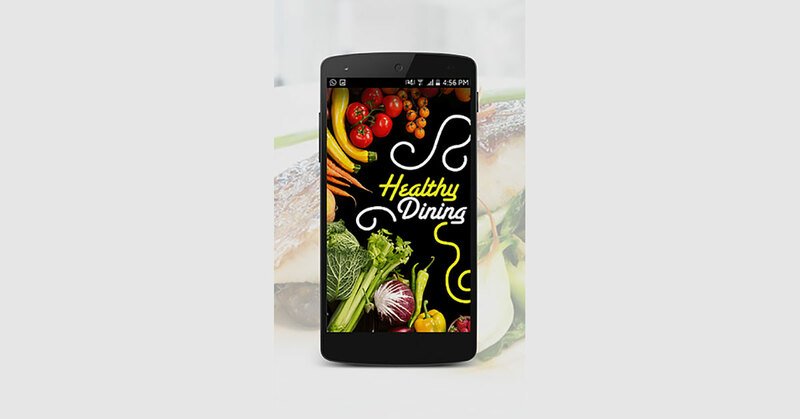 The Healthy Dining App is sleek and easy to use, from the home screen you are automatically shown trending and popular restaurants in your area as well as quick access to your favorites. The “Interest List” & “Request List” tabs make it easy to find people nearby that share your proclivity for healthy dining. When you find your match Healthy Dining makes it easy to schedule and send date/meetup requests so that networking and community building are made easy. Messaging also allows users to encourage and support each other along their journey of living a healthy lifestyle. The app’s creator, Ebony McCormick, made the Healthy Dining App around the core idea that “no vegan needs to dine alone”. Throughout time bonds have been built over food, from family dinners to business meetings over a fancy spread. Food has as been a uniting element in all cultures, however for those transitioning into new eating and diet habits meals can become lonely and isolated. The Healthy Dining App team aims to ensure that vegans and vegetarians do not spend meal time alone when there are millions of people who share the same diet concerns. Once fully transitioned to a vegan diet, McCormick quickly began to notice an overall improvement in how she felt and general health. She told us she “could not fathom why others who experienced this change would revert back to old habits”. After months of research and interviews with individuals who did not maintain the vegan or vegetarian lifestyle she found that lack of convenient options and support from others along the journey often outweighed the health benefits. McCormick recalls along her own journey of transitioning to a healthier diet and lifestyle having difficulties finding food options as well as like minded people to have healthy conversations with. These obstacles became her spark of inspiration for the Healthy Dining App, which is now helping others across the world solve the same problems. As a black woman in the tech industry she wants to set an example for her son and other children of color “to show that any and everything is possible”. She tells us that feedback has been great and over the next few months there will continue to be more updates to improve user experience and app performance.